The following passages are available on the Artchive website -- www.artchive.com -- a very useful resource for researching artists and their work. 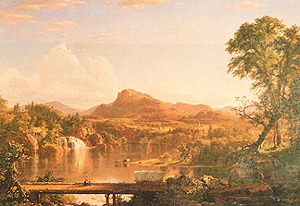 The material was excerpted from "American Paradise: The World of the Hudson River School." 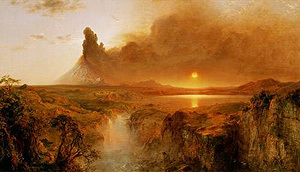 Frederic Edwin Church, born in Hartford, Connecticut, was the son of a wealthy man whose considerable assets provided the youth with the means to develop his early interest in art. By the age of sixteen, he was studying drawing and painting; two years later, Daniel Wadsworth, son-in-law of John Trumbull and, like Trumbull, a patron of Thomas Cole's, prevailed upon Cole to take Church as his pupil. Church's precociousness displayed itself quickly. Within a year, he had been shown in the National Academy of Design annual exhibition; the following year, he sold his first major oil, to Hartford's Wadsworth Atheneum. Extraordinarily gifted as a draftsman and a colorist, Church reached his early maturity by 1848, the year he took a studio in New York City, accepted William James Stillman as his first pupil, traveled widely and collected visual materials throughout New York and New England, particularly Vermont, and turned out a number of pictures, all of which sold well. As did so many contemporary landscape painters, Church settled into his own pattern of travel, hiking, and sketching from spring through autumn, followed by winter in New York painting, pursuing business affairs, and socializing. In April 1853, Church and his friend Cyrus Field set forth on an adventurous trip through Colombia (then called New Granada) and Ecuador. Church's first finished South American pictures, shown to great acclaim in 1855, transformed his career; for the next decade he devoted a great part of his attention to those subjects, producing a celebrated series that became the basis of his ensuing international fame. Nevertheless, his tastes and curiosity kept him ranging for other topics. From 1854 through 1856, in addition to retracing familiar paths, he followed new ones as well, visiting Nova Scotia, traveling widely in Maine, New Hampshire, and Vermont, and going several times to take sketches of Niagara Falls. For Church, from the late 1850s until the beginning of the Civil War was a time of triumph piled upon triumph. 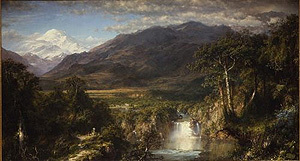 A second trip to Ecuador, in 1857, and a voyage to Newfoundland and Labrador, in 1859, provided material for future major paintings, but it was his "Niagara," completed in 1857, and "Heart of the Andes," in 1859, that guaranteed for him, still a young man, the role of America's most famous painter. In 1860, Church bought farmland at Hudson, New York, and married Isabel Carnes, whom he had met during the exhibition of his "Heart of the Andes." His marriage to both -- his wife and his farm -- became the joint center of his life, in later years tending to divert his attentions from painting major canvases. Church's happiness was blasted in March of 1865, when his son and his daughter died of diphtheria, but with the birth of Frederic junior in 1866, Church and his wife began a new family that was eventually to number four children. In late 1867, the Churches launched on an eighteen-month trip to Europe, North Africa, the Near East, and Greece that was the genesis of several important pictures. Church, however, began to devote his creative energies increasingly to gentleman farming and to the designing and redesigning of Olana, his hilltop fantasy of a "Persian" villa at Hudson, New York, a seemingly endless undertaking begun in 1869 in consultation with the architect Calvert Vaux. From the 1870s until his death afflicted with painful rheumatism of the right arm, which interrupted or prevented work on major pictures, Church still managed to produce in his later years a few large retrospective canvases. His final artistic legacy was a multitude of breathtaking small oil sketches, mostly of Olana or of the area around Millinocket Lake in Maine, where he bought a camp in 1880, or of Mexico, where he began wintering in 1882. These are at once a magnificent testimony to his undiminished gifts as a draftsman, painter, and colorist and one of the glories of American art. Scot Borofsky is a painter and writer who lives in Brattleboro.